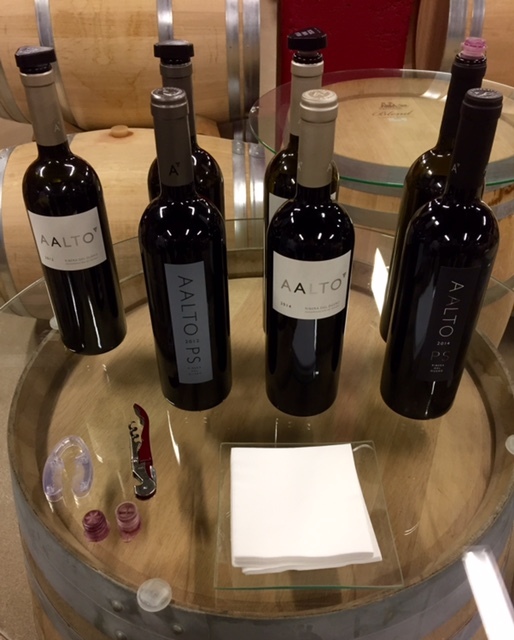 It was a beautiful sunny day in Spain’s Ribera del Duero when we pulled up to what has become one of Spain’s most highly regarded wineries: Aalto. The winery is a very modern looking building, its concrete and glass gleaming under the bright sun, making it look quite futuristic. But inside it is all business: this winery was built with the intention of producing wines that would be ranked among the best in the world. There is no tasting room (the winery does not receive guests; we were a special exception as a part of the Fine Vintages Spanish Wine Tour) and the winery was custom designed with meticulous attention to detail. 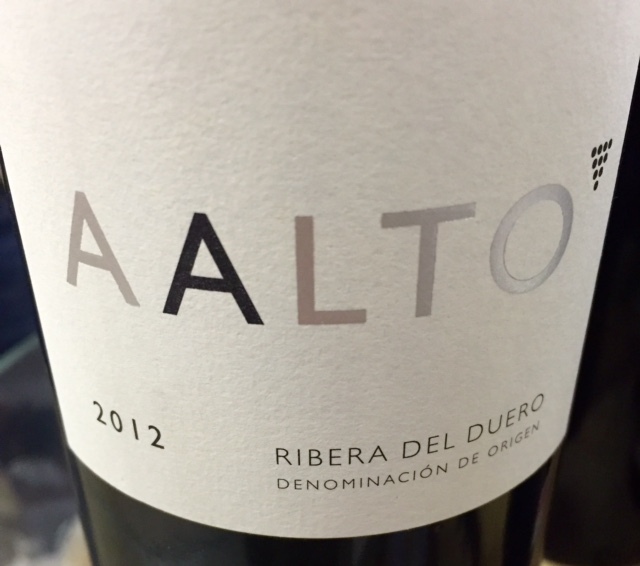 Aalto is the creation of two very important people within Ribera. Javier Zaccagnini is a hard-driving, high-energy businessman with an MBA and enough passioin to run two businesses simultaneously. 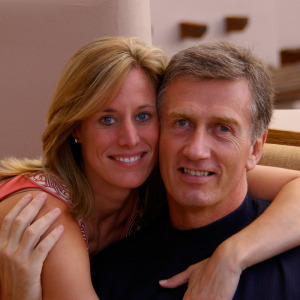 In 1992, he became the director of the Consejo Regulado, the governing body of the wine producers of Ribera del Duero. The upstart organization needed a man of his energy and managerial capability. 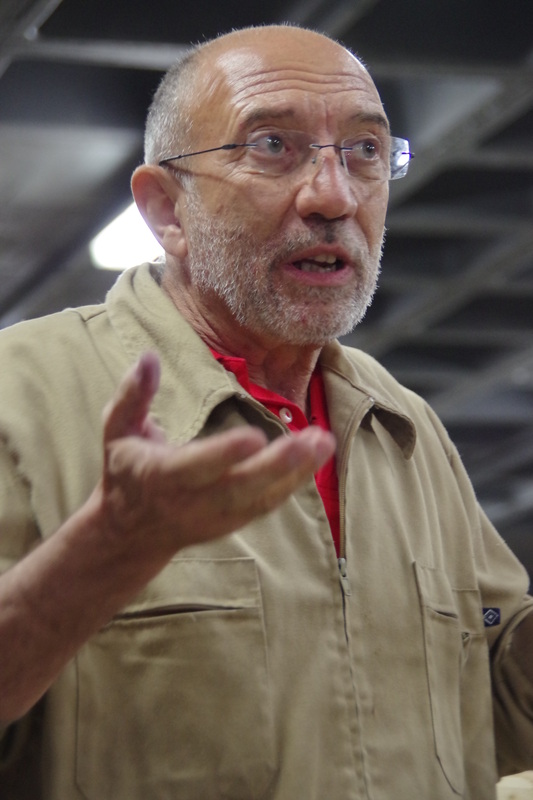 In that role, Javier would frequently take visitors to the various wineries of Ribera. Of course, at the pinnacle of the region is Vega Sicilia, the ultra-recherche winery that commands huge prices and gets sensational reviews for its wines. It was through bringing visitors to Vega Sicilia that Javier met Mariano Garcia, Vega Sicilia’s winemaker. Garcia is nothing short of a vinous prodigy, having started as winemaker at one of the world’s most prestigious wineries while in his mid-twenties and oversaw thirty vintages there. In 1998 these two men started Aalto with the goal of turning it into one of the world’s top wineries within 15 – 20 years. By many writers’ measure, including our own, Garcia and Zaccagnini have now achieved that objective. How did they achieve that feat, one that almost every winemaker dreams of but so few actually achieve? The world’s best wines require the best winemakers and the best grapes. With Garcia on board and with 30 vintages of Vega Sicilia to his credit, they unquestionably had a top winemaker. But how would they get the best grapes? This is one of the great contributions of Zaccagnini. As director of the Consejo Regulado, he knew all of the vineyards in Ribera. He selected the best of the best and with Garcia in tow, he went out to meet them and secure the very best plots for Aalto. When you have the top winemaker in the country asking to make wine from your grapes, it is pretty easy to say yes. Contracts were then entered into to acquire grapes from certain plots within these vineyards and in 1999 the first vintage of Aalto was produced from purchased grapes. 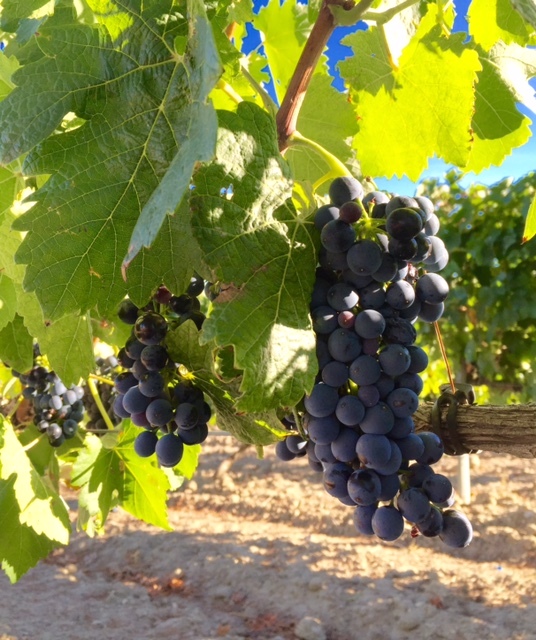 Today they source grapes from a total of 110ha planted to old vine Tempranillo. 45ha are owned by the estate and the rest are rented and farmed to Aalto’s exact specifications. The vineyards all sit at very high elevations, between 750 and 950 metres. 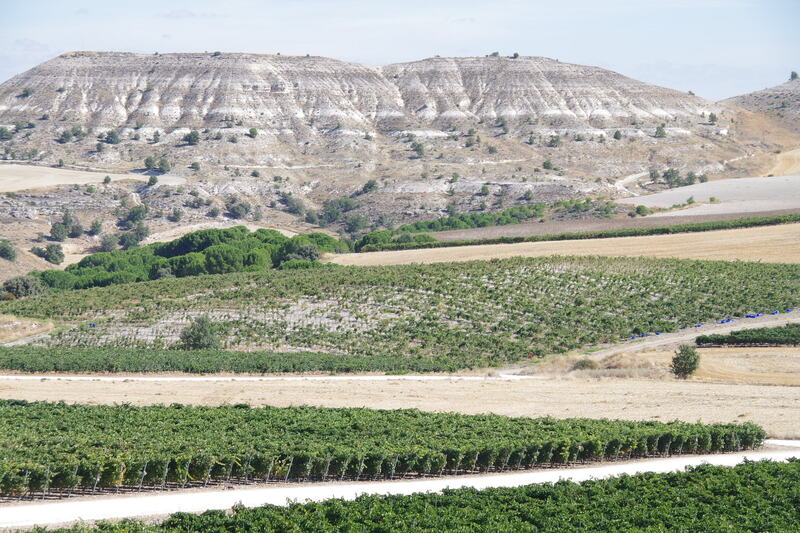 They are spread out across all three of Ribera’s sub-regions and therefore see a diversity of soil types: clay, limestone and hard chalk. 20ha are young vines, recently planted using massale selection, the process of taking cuttings from existing old vines and propagating them at the vineyard site. The remaining 90ha are 40 – 100 years of age, all planted to Tinto Fino, the Ribera clone of Tempranillo that over the last century has adapted to the region’s harsh climate. Inside the winery is a marvel of modern efficiency and innovation. 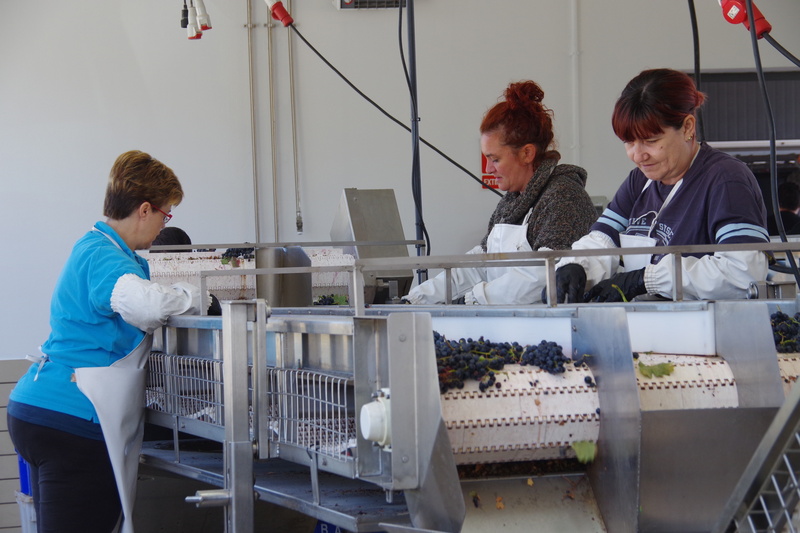 The wine moves through the various stages of production through gravity flow which allows for a more gentle handling resulting in a finer wine. The wine is fermented in a combination of concrete and steel tanks. The steel tanks are custom designed by Garcia in a conical shape that helps to extract colour and tannin from the cap. Gentle pump-overs assist this process. 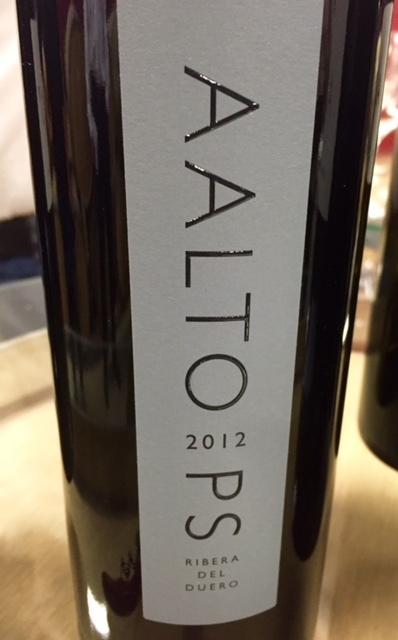 Two wines are made at Aalto: Aalto and Aalto PS. Aalto is made from vines that are 40 – 60 years of age. 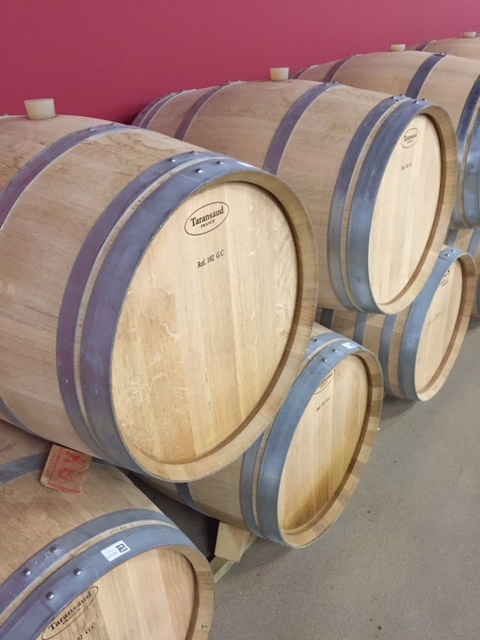 250,000 bottles are made per year; the wine will spend 16 – 20 months in a combination of French and American oak barrels that are 1, 2 and 3 years old. Aalto PS is their “reserve” wine. 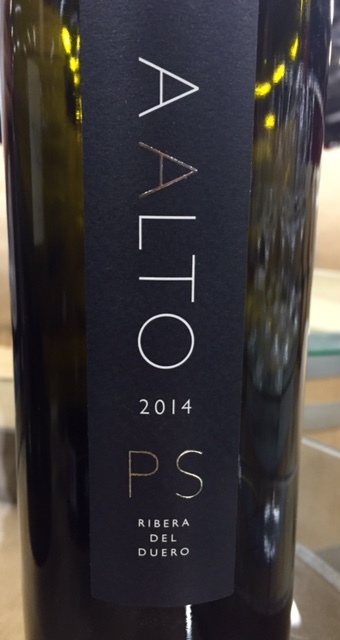 PS stands for Pago Seleccion, the Spanish term reflecting that only specially selected plots (pagos in Spanish) are used to make this wine. 10,000 bottles per year are made, but only in very good vintages. There was no PS made in 2002 or 2007. Aalto PS is raised in 100% new French oak. Aalto makes wines very much in the modern style. In this way it can be contrasted to Vega Sicilia, which would be seen as a more traditional bodega. The goal at Vega Sicilia is to produce wines capable of extremely long aging; they will frequently wait until 10 years after the vintage to release their wine, so that it will be ready for consumers to drink. Aalto pursues a riper, bolder expression; certainly one that is capable of aging (the winery thinks up to 20 years), but one that can also bring more immediate pleasure. In that way Aalto has been compared more to Vega Sicilia’s other project in Ribera, Alion. Comparisons aside, what we tasted were truly profound wines. The house style is to pick very ripe fruit that has the intensity to stand up to and benefit from longer barrel-aging in relatively new oak. The result is a wine packed with bold red and black fruit flavours, polished tannins and a rich, mouth-coating texture. The wines we tasted had impeccable balance and great sophistication and showed that Garcia and Zaccagnini have achieved their goal of creating one of the world’s great wineries. Very dark red colour, almost black. Very expressive nose of black cherry with notes of brown spices and vanilla. The palate is full-bodied but wonderfully round and no hard edges. At this stage of its development the fruit definitely dominates but much greater complexity should evolve after some time in the cellar allows the fruit to settle in. We pick up flavours of plum and black cherry with minerality kicking in on the long finish. Extremely dark red, almost opaque. The aromas of black cherry and baking spices literally leap out and greet your nose well above the glass. Here the dials are turned way up. Full bodied and densely packed, it has intense flavours of plums, black cherries, blackberries and spicy, vanilla-tinged barrel notes. There is a plushness to the mouthfeel that feels like a high-class Pomerol. Rich in texture and already complex, this wine will reward at least a decade of cellaring, and probably two. Quite similar to the 2012 Aalto, perhaps even better. The nose it slightly spicier, a little more complex. Even though it is younger, it has a smoother texture. Lots of plummy fruit on the full-bodied palate. Delicious! This wine was truly remarkable. Like the 2012, the aromatics on the PS were waves of blackfruits, cherries and spices that just kept coming. Beneath the fruit were subtle hints of vanilla, and on the finish there was a peppery note. This wine delivers a powerful statement without being at all overbearing. The blackberry, raspberry and plum fruit notes show ripeness without becoming jammy. There is perfect balance between the fruit, the tannins and acid which results in a rich, textured mouthfeel that is positively seductive. An amazing wine tasting experience. Definitely age worthy and we’re putting our 2014’s down for a few years but remarkably smooth and approachable given their power and intensity. Totally agree with you, there’s a complexity here that deserves some patience! admin on ABC: Anything But Chardonnay? Kathy Molnar on ABC: Anything But Chardonnay? Rick Dean on ABC: Anything But Chardonnay?